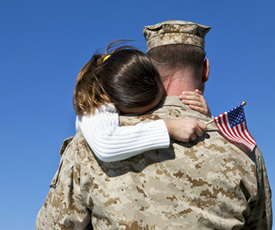 The initiative helps members of the U.S. Military reconnect with their families and assimilate into a peacetime home environment. The Callaway Homecoming Initiative helps returning soldiers reconnect with their families. "Decisions related to parenting, finances, and all the routine daily tasks have been the sole responsibility of the spouse, who suddenly is expected to give up control when the soldier returns," says Emory psychiatrist Doug Bremner. "Additionally, the soldiers have missed seeing their children grow and mature, and being involved in their activities. They may feel like strangers in their own homes." The program—set in the foothills of the Appalachians and supported by Callaway Gardens, Fort Benning's Maneuver Operations Center for Excellence, and Emory—helps soldiers return to family life.